I paid $5.87 for this record. This project stars the vocalist from Spraynard. I'll make no secret about it, I love that dude. He looks like he'd be a good math teacher, but his nasally pop-punk vocals and straight shooting heartfelt lyrics really do it for me. 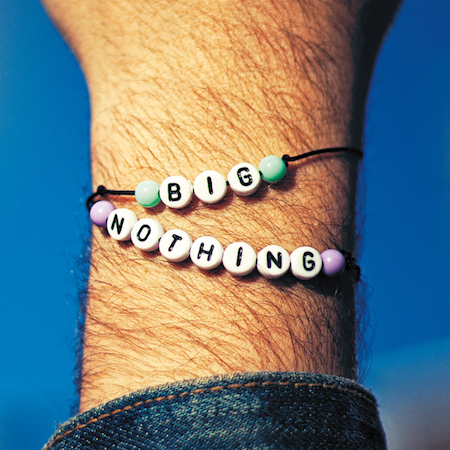 Big Nothing is not screwing around with this first track and it's pretty amazing. "Cincinnati you stole my heart" is a lyric that is well-placed in the chorus and an instant hook in a meaningful story of love and loss. Call Me Out slows it down a bit to show off the skill of the other vocalists in this band and the harmonies are definitely a change from Spraynard, though they throw in a little rough-edgedness with some prolonged guitar adventures in feedback and tonality. It's a decent song, but track 1 sets it up to fail, a bit. Flip this beast over and you're rewarded with a bombastic use of rhythmic hits and pauses. It's just on the verge of being ready for arena rock if it was super polished and the vocals were a little more on point and there were even more guitar solos. But the layered outro and the guitar intro and the repeated chorus push towards crowds of immeasurable size. The last track slows again and gets nicer, pushing the female vocals to the front, with a great instrumental drop out for the first instance of the vocal hook "Sugar coat everything". I'd kind of prefer the rough-vocaled guy didn't join in on that hook for a bit, but it does provide nice contrast to the solo. Still, it's probably my third favorite song on this record. It's almost a shame that Cincinnati was the first track because you can tell that track had been on someone's mind and needed to be written. The others don't have that same urgency, that same depth of thought and feeling. They're far from terrible, but they're not the same level as the first track.